Powers: Illusion casting and enhanced Charisma. He has used this power to create an illusion solid self image. Slick was a shy black mutant boy, pug nosed, pointy eared, diminutive and with webbed feet. He was a complete recluse those he enjoyed playing his guitar. 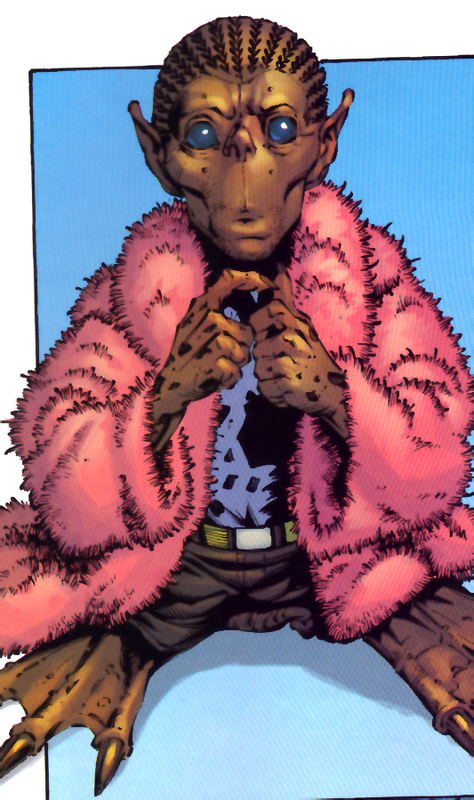 Once his powers matured he got over his reclusive behavior by building for himself an illusion of his ideal self, Tall, handsome and trim much like Mastermind had done when a member of the hellfire club. This new image coupled with his burgeoning charismatic powers made him one of the most popular students at the Xavier institute. He even landed the mutant Tattoo/Christine Chord as his girlfriend. When his ego outgrew his powers however his illusion was shattered by Quentin Quire/Kid Omega. Embarrassed and ousted in front of the whole school he lost his popularity and his girlfriend. He was later de-powered on M-Day. What’s wrong with “bald headed African American females”?